Since the 1890s Sikhs from India migrated to East Africa during the British Colonial Rule. Many of the Sikhs were employed in building the railway lines between Kenya & Uganda. 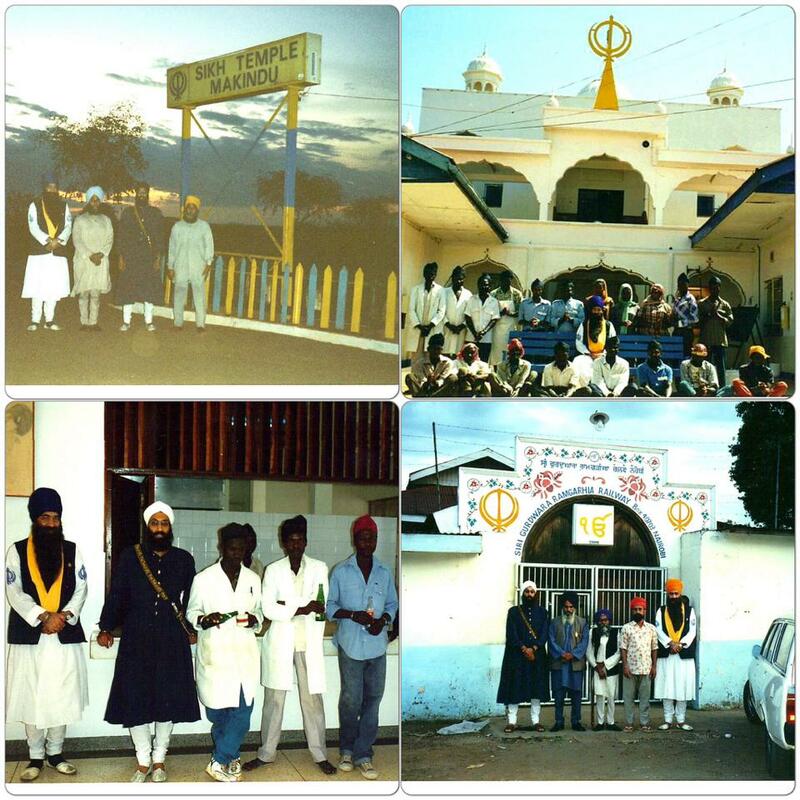 From 1900-1950s Sikh community of Kenya, Uganda & Tanzania was one of largest outside of India, they established themselves, built gurdwaras & Khalsa schools for the Sikh families. Baba Puran Singh 'Kericho wale' migrated to Kenya in 1916 & did a lot of Sikhi parchaar in Kenya until he moved to the UK in 1974 & founded the Guru Nanak Nishkam Sewak Jatha (soho road). A Large number of Sikh families left East Africa during the 1950s due to civil unrest from the end of British colonial rule. Bhai Sahib Rajinder Singh was focused on doing Sikhi parchaar in those countries where very few Sikh parchaaraks (preachers) traveled. Bhai Sahib travelled to Kenya (1992/93). The Makindu gurdwara established in 1926, the picture of Bhai sahib with 'Indigenous African' Sikhs is at this gurdwara. Bhai sahib observed that the Indigenous African Sikhs did a lot of sewa at the Gurdwara, preparing langar & cleaning. They had told bhai sahib of their wish to take Amrit. Many of the Indigenous African Sikhs had adopted the Sikh rehat (keeping hair, tying turbans, vegetarian diet) & had changed their names to punjabi names. During that trip Bhai sahib did not have a Jatha with him nor were there enough Singhs to hold an Amrit sanchar. The other gurdwara he visited was Sri Gurdwara Ramgarhia Railway Nairobi, established in 1903. It is said at this gurdwara there is 'Shaheed Singh' observance (payra). Many singhs had died building the railway lines during the British colonial rule. Bhai sahib had a desire to take Jatha back to Kenya & do an Amrit sanchar, unfortunately he was never able to go back. In our history there have been very few Sikh parcharaks who have reached out to other races & organised baptism (Amrit) for them. Bhai sahib was delighted to see other Sikhs from other races & encouraged & supported them in their sikhi way of life. He often took them on parchaar: Bhai Shiv-charan Singh (British), Bhai Jassa Singh (Swedish), Bibi Manjit Kaur (European) & Bhai Sat Kartar Singh (Congolese French national). As part of writing Bhai Sahib's biography we would like to find out more about this trip & about the Singh (who is wearing blue chola & wearing glasses) who accompanied Bhai Sahib from the UK, we don't know his name. Please assist us by circulating this post to any contacts within Sikh community from East Africa in UK & to contact us.